Tired of working the 9 to 5 grind just living paycheck-to-paycheck while making someone else rich? Do you want to be an active part of your family rather than just a spectator? Are you meant for so much more than someone not hearing your ideas? Or, someone telling you how or what you feel is wrong even though you know it could be an excellent path for someone else? In school getting while I was getting my master’s degree a female teacher completely crushed a dream of mine. I created a support program for the women and children facing domestic violence, and she flat out told me it would never be accepted. She turned down my idea because I wanted to teach women and children self-defense. Now it’s vital that you hear this part very clearly; I want to make sure that women and children love themselves enough to go out and learn self-defense techniques and to have enough self-love to actually utilize them when they are in danger. And she told me I was wrong. My teacher hated my proposal. She drilled it into my head that if I continued with programming, the way it was, I would fail. And, on top of failing, I would only be met with controversy. So one of the lessons I learned is that “in order to do what I needed to do I shouldn’t look for anyone to back me. I need to do it myself.” I was all set to do it myself to take on this coaching business to teach self-love, advocate for self-defense and to show women how to build strong relationships all by myself. 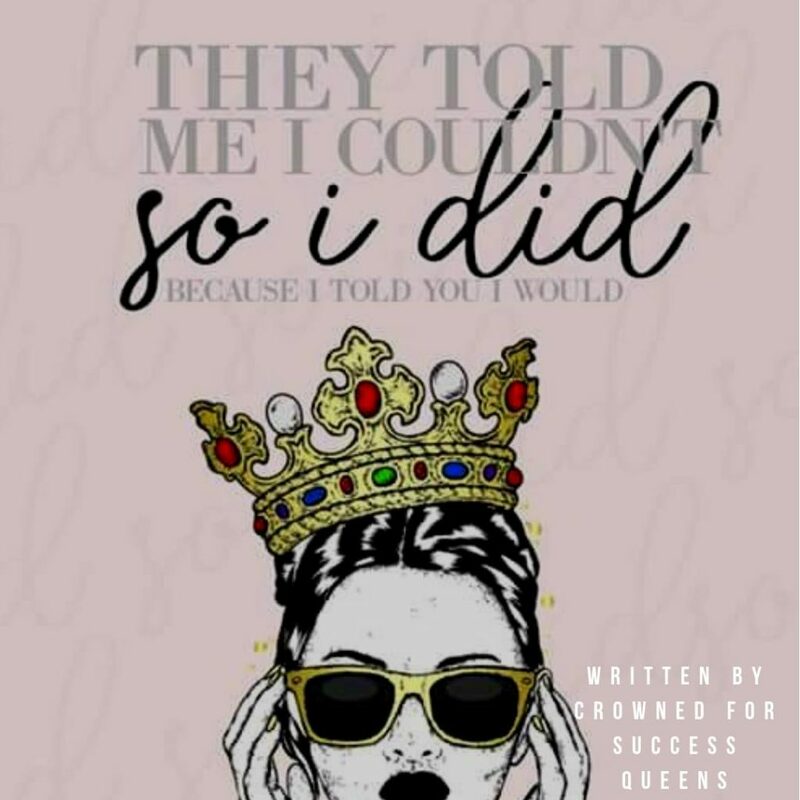 The moment I made that decision Wendy Porter, the sole and sass behind Crowned for Success entered my life. I learned that having a community makes it so much easier to change the world. Because I found the heart-centered women of Crowned for Success. At the time that I need a community the queendom appeared. And in it I found the Six Figure Instagram and, more recent, The Manifesting Queens Society. I found Wendy and her site. And while I was ready to make my move, my wallet was not. So until my wallet caught up with my ambition I bought her lower-priced offers, opted into every freebie that she had, and saved up money for whatever program what’s going to come about next. When her next program launched, it was another cycle of her Regional Vice President program or RVP program. I had jumped at the chance saved my money invested in this, and I have regretted nothing ever since. Here is a program that was created to meet everyone where they are at. It’s for women currently in business, and have been for years. I connected with women that feel stagnant, and there were women like me who were just starting their business. There’s an affiliate commission program, and every RVP gets first dibs when there are opportunities within her kingdom, like coaching and heading up a new visibility platform. Not mention Wendy extends opportunities she gets through the network that she created as well. If you’ve ever wondered if you should start a new business, here it is. Move forward in your business, you can do it! We are here if you just need a Network full of supporting women. And if you’re thinking about joining, please follow this link Crowned for Success Regional Vice President Ambassadors. Or you can simply leave your questions in the comments, and I’ll answer them. Do something good for yourself, a favor if you will and check out this investment. Crowned for Success Regional Vice President Ambassadors.